Last night we successfully brewed #nitrotea with the help of our knowledgeable friends at @blacksandsbeer. We haven't seen anyone do it in San Francisco, so we took it upon ourselves to figure it out. We chose Black Coil to cold brew for its great malty flavor. The result after kegging it in nitro was sublime; it was super smooth, clean, and it created a much silkier mouth feel that's unlike anything you've ever had. When drafted, it cascaded like a Guinness beer! We will continue to experiment, so stay tuned! 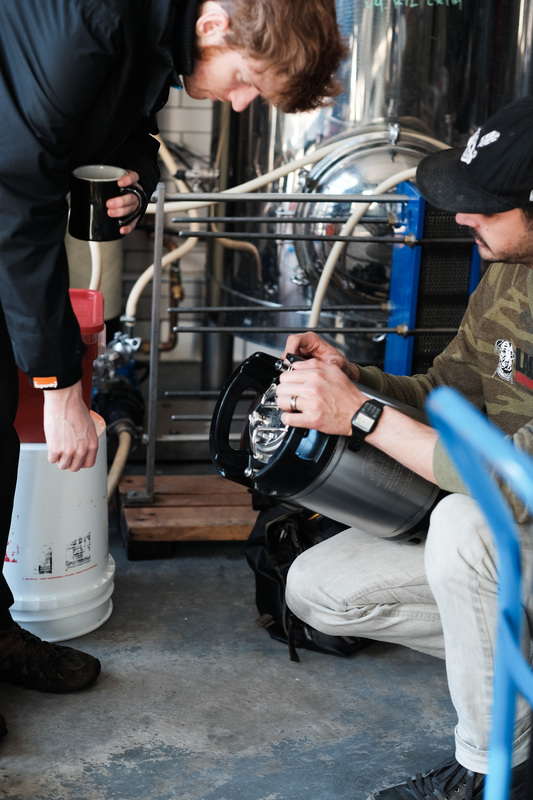 Cole, head brewer at Black Sands Brewery explains the basics of kegging. In homebrewing, it's all about washing and sanitizing. We place our cold-brewed black coil tea into the baby keg. We take a quick break to try some of Cole's weirdo loquat beer experiment. Tasty! "Too much NOS will blow the welds on your intake manifold." Cole hooks up the nitro line and cranks up the PSI. Nitrogen is now being fed into our keg. Our keg goes into refrigeration while it absorbs nitrogen.